STATE COLLEGE, Pa., Nov. 9, 2015 /– AccuWeather, Inc., the global leader in weather information and digital media, today announced the launch of the new AccuWeather app for iPhone, iPad and iPod touch, that’s exclusively available for iOS users. 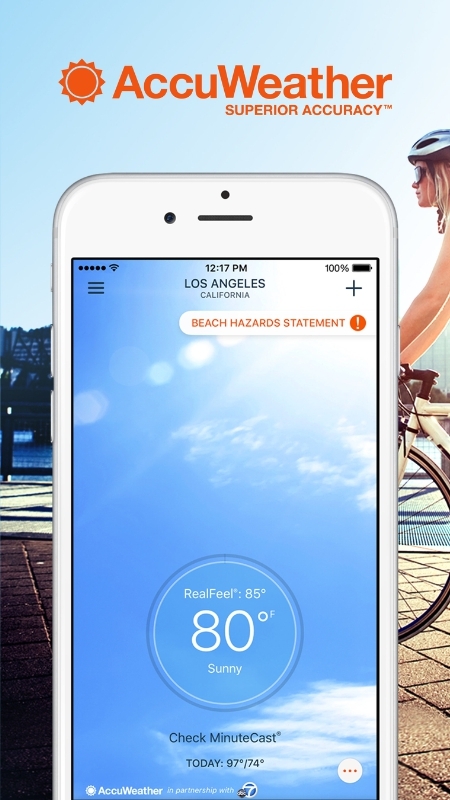 For a third year in a row, AccuWeather was recognized by the Academy of Interactive and Visual Arts (AIVA) with digital awards, including a 2015 Gold award for the iOS app. New innovations include an all-new look and feel, instant access to AccuWeather’s top-trending weather video content, and improved navigation and speed to further enhance the user experience. The industry-leading app combines advanced displays and wording with customized and localized weather information with Superior Accuracy™, personalizing the weather so people can improve their lives. The AccuWeather app for iPhone, iPad and iPod touch provides a fresh new interface and design with clean lines, colors, and modern icons, making the digital experience more appealing, intuitive, and easy for users than ever before. AccuWeather app users will also experience an increase in the speed of the interface and easier access to functionalities such as persistent navigation, allowing for simpler ways to access the app’s most popular, proprietary weather features. In addition to engaging breaking weather video content, new look, and universal app functionality improvements, the app provides unique features such as the patented AccuWeather MinuteCast®, the only global minute-by-minute precipitation forecast for a person’s exact street address or GPS location, and AccUcast®, the exciting interactive crowdsourcing feature through which users can share their local weather and any potential hazardous conditions. Additional app weather features include severe weather alerts and notifications, interactive weather animations illustrating current weather forecasts, forecasts for the next 72 hours, and animated weather radar and maps. Other popular features include detailed day/night forecasts, local forecast summaries, forecast previews for the next 3-5 days, and widget access. AccuWeather widgets provide a summary of what users can expect from today’s weather and are easily accessible from the Today screen through the device’s Notification Center. AccuWeather has seen double-digit increases in mobile digital traffic as a result of increased consumer demand for its trusted all-weather content. The iOS app continues to generate high active user growth rates, +65% year over year on iOS devices, demonstrating impressive momentum and interest in AccuWeather’s unique on-the-go weather experience. The W3 Awards are the most recent among numerous accolades that recognize AccuWeather’s success in providing a best-in-class weather app experience with Superior Accuracy. Every day over 1.5 billion people worldwide rely on AccuWeather to help them plan their lives, protect their businesses, and get more from their day. AccuWeather provides hourly and Minute by Minute™ forecasts with Superior Accuracy™ with customized content and engaging video presentations available on smartphones, tablets, free wired and mobile Internet sites, connected TVs, and Internet appliances, as well as via radio, television, and newspapers. Established in 1962 by Founder, President, and Chairman Dr. Joel N. Myers – a Fellow of the American Meteorological Society who was recognized as one of the top entrepreneurs in American history by Entrepreneur Magazine’s Encyclopedia of Entrepreneurs – AccuWeather also delivers a wide range of highly-customized enterprise solutions to media, business, government, and institutions, as well as news, weather content, and video for more than 180,000 third-party websites. AccuWeather’s CEO, Barry Lee Myers, is an award winning leader in global weather information issues and one of the world’s most recognized advocates for cooperative relationships between government weather agencies and the weather industry. He is a leader in the digital weather information space.